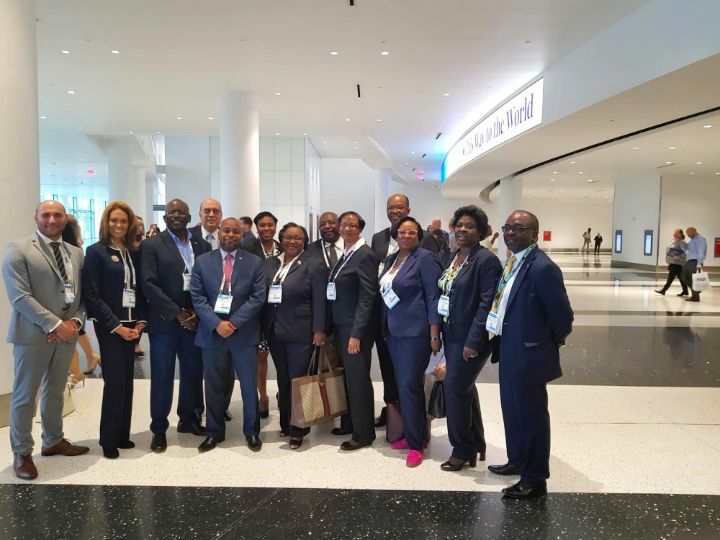 MINISTER, MOT, MARITIME AUTHORITY – Minister of State for Grand Bahama, Senator Kwasi Thompson (fourth from left), joined by representatives of the Bahamas Ministry of Tourism and the Bahamas Maritime Authority at Seatrade Cruise Global 2019 Conference in Miami, Florida, April 8-10, 2019. Nassau, The Bahamas - Minister of State for Grand Bahama, Senator the Hon. Kwasi Thompson, said that the new proposed Carnival Cruise Port, slated for development in East Grand Bahama, was announced to over 11,000 people within the cruise industry, during a recent conference in Miami, Florida, April 8-10, 2019. It was during one of the opening sessions of the Seatrade Cruise Global 2019 conference that President of Carnival Cruise Line Christine Duffy told the over 11,000 participants at the conference about her company’s major development in Freeport, Grand Bahama. Minister Thompson said Ms. Duffy announced that for the first time in the company’s history, Carnival will be investing significantly in one of the largest port investments to date in Freeport. She also spoke about the major impact the development was going to have on Freeport and its citizens. Minister Thompson, along with Permanent Secretary in the Office of the Prime Minister Harcourt Brown and Felix Brown from the Investment Unit in the Office of the Prime Minister, all attended the conference in Miami, Florida. 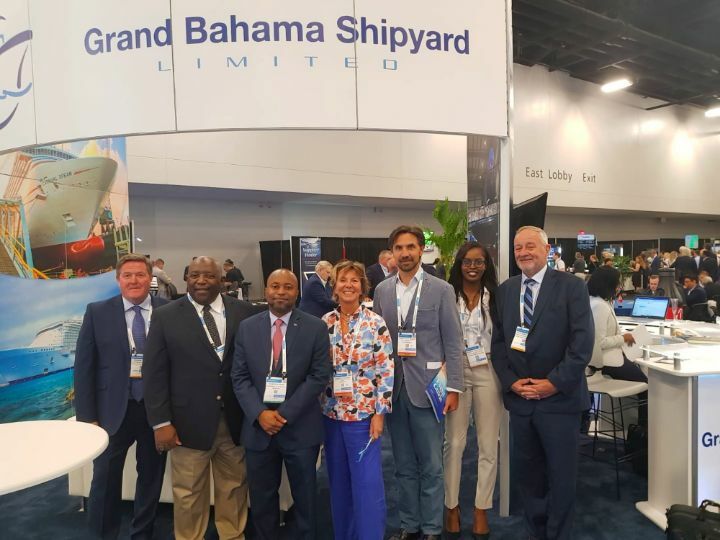 SHIPYARD AT CONFERENCE – Grand Bahama Shipyard was one of major players with a booth, at Seatrade Cruise Global 2019 Conference in Miami, Florida, April 8-10, 2019. Minister of State for Grand Bahama, Senator Kwasi Thompson and Permanent Secretary in the Office of the Prime Minister Harcourt Brown stopped by the GB Shipyard booth along with representatives from the Grand Bahama Port Authority. Minister Thompson is pictured third from left; Mr. Brown, second from left; Vice-Chairman of the Grand Bahama Port Authority Sarah St. George, centre. Grand Bahama Shipyard was an active participant in the conference, as was FOWLCO (A Grand Bahama marine logistics company). Minister Thompson said that attending the conference was in keeping with the government’s commitment to establish Grand Bahama as a maritime centre. “I was also very pleased that we had continuing discussions with executives from the cruise line and from the maritime industry,” he added. “The real purpose of attending was for us to continue to promote Grand Bahama as a maritime center. Minister Thompson also pointed out that the second ‘plus’ for the Office of the Prime Minister’s attendance at the sea trade conference was that it allowed him, as Minister for Grand Bahama, to speak at a significant conference segment hosted by Grand Bahama Shipyard. Over 100 people attended that particular function -- executives from the cruise lines and maritime industries, as well as customers, partners and subcontractors with the Shipyard. “Again, that event and the opportunity to speak there, gave us another opportunity to promote Grand Bahama as a maritime center. “We were also promoting Grand Bahama as a place where industry that supports the shipyard could be built. So we spoke to those individuals who outfit the cabins while the ships are on dry dock – including those who repair engines and even those who are sub-contractors for those ships while they are on dry dock. Also attending the conference were representatives of the Bahamas Ministry of Tourism, the Grand Bahama Port Authority, and the Bahamas Maritime Authority.